ASEDeals is currently having a sale on select models. Our BendPak two post 10,000 lb lifts and our 9,000 lb. four post lifts are currently on sale at the lowest prices for the season. If you’re on the market for a quality two post lift, now is the time. 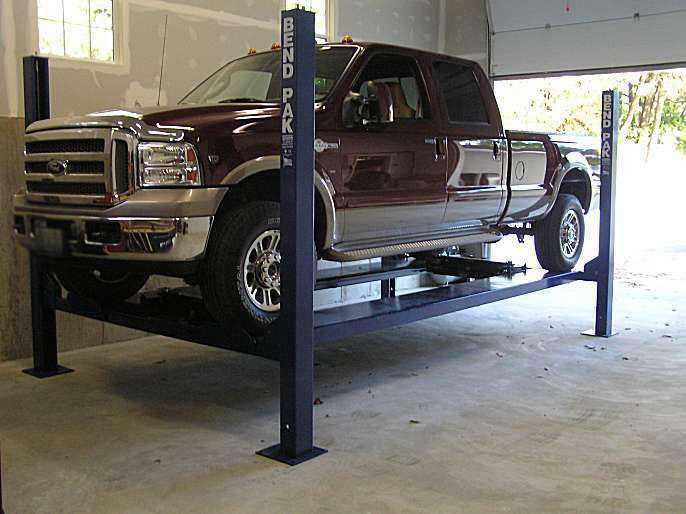 BendPak’s latest models are chocked full O’ features and quality that you just won’t find on your typical car lift. The XPR-10ACX asymmetric lift has the ability to position it’s arms symmetrically in the event that you have a vehicle that has more of it’s weight in the rear and therefore would not balance out well in the asymmetric position. They are nice and stout, with taller lift carriages (53 inches tall), that leads to less stress on the posts. The most popular feature is the 3 stage arms in the front which means greater ability to reach at various vehicles jacking points that might be difficult to reach with the traditional two stage arms found on most car lifts. Plus, when you purchase a BendPak Lift, you can buy with confidence that your getting one of the best lifts in the industry, at a very reasonable price. Bend Pak will always have parts for their lifts, even the old, discontinued models. Try getting parts for a discontinued model from one of those bargain car lift manufacturers out there. And let’s not forget about ALI Certification. It means so much for a lift to be ALI Certified. But most importantly, it means you know you’ve got a lift that meets very strict safety and quality standards, and that it has a ALI, “Gold Seal” of approval. Finally, there’s BendPak’s 5 year limited warranty that includes one year of on-site service. As they say, timing is everything. And right now, with our summer sale on our BendPak Lifts winding down, the time is right for a great deal on a Two Post Lift. Don’t miss out. Performing a transmission fluid exchange service can be lucrative for your auto shop. This fact is a large reason why many automotive repair facilities are purchasing a Transmission Flusher, or transmission fluid exchanger. Once you explain to customers the benefits of this service, it’s an easy sell. The purchase of one of these machines will pay for itself within a very reasonable time frame comparatively speaking, when compared to other major pieces of shop equipment. Once the decision to purchase a transmission machine has been made, then the more difficult decision is ahead of you. With all the machines out there, which one should you get? We carry several models by two different manufacturers. Both manufacturers are top notch with machines that are state of the art an include great warranties and parts availability. The best news is, they’re all made in the USA. TTech has two different machines. 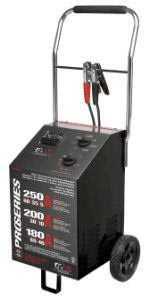 First the TT400, which is powered by 12 volts DC. This unit has 23 fittings and has quick connects to the cooler line quickly and easily. It exchanges 100 % of the ATF in a proportional, even exchange. The TT500 has the same features as the TT400, but also includes some additional features. It has a backlit fluid cylinder, so you can see the fluid level easier. It also includes point-of-sale literature to help you explain the benefits of the exchange. This model includes a more comprehensive supply of 34 fittings. This model also operates off of 110 volts AC. We also carry machines by RTI. They have the most technologically advanced machines with fully automatic operation. They have Fluid Flow Direction Indication – Automatically indicates if you are hooked up to the vehicle correctly. Audible alert and light signal technician to reverse hoses if necessary. They also have a comprehensive color coded adapter selection with reference chart. They even have a model that allows you to stick a probe down the dipstick tube for the fastest service around. RTI also offers an optional add-on feature – a Power Steering fluid exchanger. Yet another revenue producing service. Give us a call and we’ll go over all the details with you so you get the machine that’s right for you. Home Hobbyist four post lift customers have had the choice of an extra high lifting model for several years now. They typically desire the extra lifting height because they want to park a taller vehicle underneath and another car on top. If you’ve got a taller automobile, like an SUV or truck, and you need to park it underneath the automotive lift, you can’t get by with the standard height models. You need an extra high lifter. We carry three different manufacturers, and all three offer an extra high lifting 4 post lift. But all of these lifts are made for home / hobby applications. Nobody really offered a commercial four post lift that has the extra high lifting feature. Until now. Bend Pak has recently come out with their HD-14TL extra high lifting four post lift that is a 14,000 lb. capacity lift that lifts an extra foot higher than the standard model. There are certain customers who desire this feature in commercial auto shops, and then again, there are also some home car enthusiasts who need the extra heavy capacity, or the larger dimensions for the heavy duty capacity for their full size, long bed or crew cab trucks. It’s got the same dimensions as the standard HD-14 four post lift, except for the column height, and the lifting height. The columns are 100 inches tall and the height to the underside of the runways when the lift is raised all the way to maximum lifting height is 82 inches. One factor you should realize when reviewing that particular specification is that the top locking position is actually four inches lower than the maximum lift height. So the actual clearance underneath the runways when at the top locking position is 78 inches. BendPak is always innovating and is a leader in manufacturing Automotive Lifts. If there’s a need out there, they are sure to fill it. 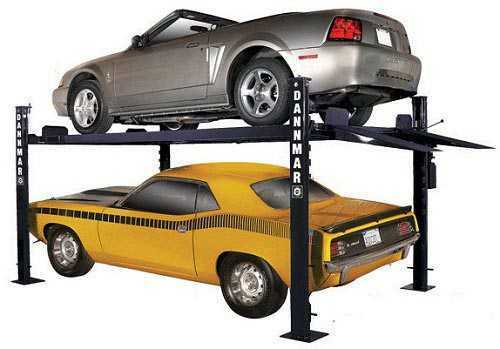 If you’re a home / hobbyist looking for a Four Post Lift for storing one vehicle over another, or just for servicing your vehicles, you’ve got many choices out there. We carry three different manufacturers. Most lift manufacturers will have similar options when it comes to accessories. An alternative to the jack plate is the air bridge jack. This would serve the same purpose as the jack plate, but integrates an air jack into it, making it much easier and more convenient to work with than the jack plate. It is truly a professional accessory. If you’re using your car lift for servicing your car, then odds are, you’re going to be changing your oil from time to time. So an oil drain is almost a must-have item in this case. After all, you don’t want to have to hold a bucket over your head. There are many different oil drain options available. Some roll on the ground and have a long neck and a funnel on the top. Others roll up and down the length of the runways and remain mounted to the lift. Accessories that come in handy for your four post lift when using it for storing your cars would be the drip trays and caster kit. The drip trays would rest in between the runways and are sold in sets of three. They are there to protect the car underneath from getting drips on them. Since most home / hobby four post lifts are free standing, the optional caster kit would be used to roll the lift around your shop, or perhaps even out your Garage Door if it will fit. This makes your four post lift a truly portable lift. This is a handy feature that makes your lift more versatile. These are just some of the more popular four post lift options. We will delve deeper into some more options in a future post. Customers frequently want to know what payment methods we accept. There is a wide variety of payment methods that are available to customers. We accept any major credit cards; American Express, Visa, Mastercard and even Discover. We accept personal checks, business checks, bank checks, certified checks and money orders. We even can do a check by phone. We would just need your checking account information to process it. This information includes your account number, routing number and name and address on the checking account. It must be a standard checking account to be able to process a check by phone. It cannot be a check from a credit card issuer, or one of those temporary checks that the bank gives you until your official personalized checks get manufactured. You can also wire the funds directly into our account from yopur bank account. You would need our checking account information for this. We also offer financing. Interest would apply. 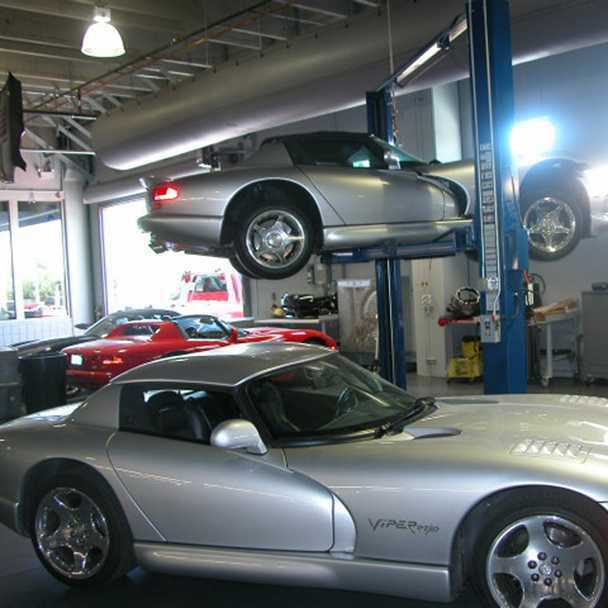 Financing is typically sought out by customers who are starting out opening a new auto shop and they may be purchasing large quantities of equipment, or maybe several pieces, like a Car Lift, a tire changer and wheel balancer, or and expensive piece like an alignment machine. The quickest way to get your equipment shipped out to you is to process your order by credit card, or wire transfer. We can ship the product right away given these methods of payment. Checks by mail and by phone require us to wait for the check to clear, which could add a few days to your order, so factor that into your time horizon. The slowest way to make payment would be to finance your purchase. Financing adds up to a week to the time frame because there is detailed paperwork that must be completed. We’ll go into more details about the financing angle in future posts. Give us a call with any questions regarding the method regarding payyment. Whatever method you choose, It will be well worth it. You are currently browsing the Car Lift Blog blog archives for August, 2010.